Online stores have transformed the life and in this contemporary era, everything is available to the user at a single click. Whether it is medicine, cosmetics, clothes, or birthday bouquets and flowers everything is available at the drop of a hat. 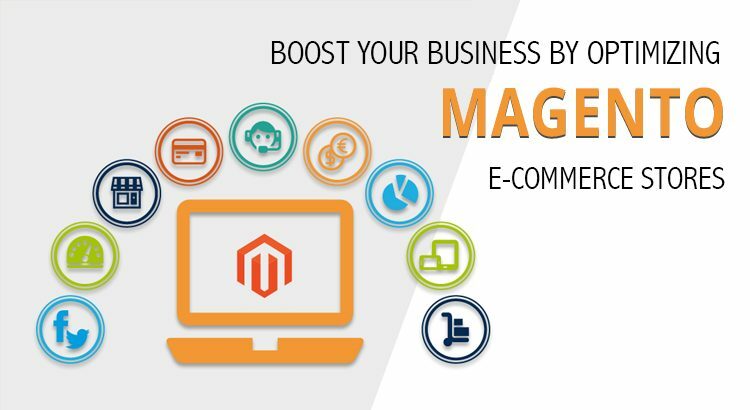 Magento is one of the most sought after e-commerce platforms and all businesses must make sure that their Magento store remains optimized for all the visitors. Magento, one of the foremost e-stores engines is the best option for boosting the business and increase ROI. Magento allows us to run several ecommerce stores on one platform which displays different products. Optimization of e-commerce is advantageous for the outstanding performance of Magento. Optimizing is a long-time process which requires a lot of effort. Hence, one must not ignore the importance of website speed and how it impacts the e-store conversions. One must timely optimize to get maximum conversions. To exemplify, if the page load speed increases for 1 sec, it can have a drastic impact and improves the conversion rate to a great extent. Following are the list, features, and tips to optimize your Magento e-commerce store and boost the performance. Magento is all around hosting so one must not become a prey of cheap hosting plans. A cheap hosting plan can seriously diminish the functionality of the resource-heavy Magento store. It is best to spend some money on the best hosting plans when one is having excellent resources and an amazing store from which they can earn millions. It is mandatory to provide dedicated hosting as search engines rank the websites depending on their loading time. Hosting is very beneficial to increase the resources. For the effective success of any online store, multimedia elements are crucial. Clients are attracted more towards the visually appealing store and hence, using high-quality images and videos is the best way to add such elements in the store. Size of an image is really significant as it has a direct link to the page loading speed. The best possible way to cope up with the same is to use CDN that boosts the page load speed. Your image must depict the required information about your product. Magento offers dynamic and simple search integration for your store with AJAX based search algorithms. The best thing is that the default search capabilities of the Magento stores could be augmented through third-party extensions with the addition of powerful search algorithms. The scenario has a great positive effect on the User Experience and sales and profit of the store. A powerful and dynamic call-to-action button can build a connection between a client’s desire and availability. It benefits the user by providing immediate access to the content. A potential client is only converted to a customer when they get a good deal online and the store is appealing and persuades them to shop. Hence, it is the need to present the amazing and wondrous deals at the appropriate locations on the store through the use of CTA’s or widgets. CTA must not interfere with the user experience. User Experience is directly related to the theme of your store. An unoptimized and unattractive theme could slow down the store to a crawl. Selecting the theme should not be a difficult task for the store owners. Having in-depth technical knowledge can help the technical features of the themes to come up with the appropriate fit for your business model. Working with a Magento expert is really beneficial. The most significant thing to consider is selecting a template that matches your services and offerings. The present era and global commerce have shifted to the mobile devices. These days the maximum number of online sales transactions originates from mobiles and smartphones. E-Commerce stores benefit a lot by setting up a mobile-first storefront and then offering comprehensive discounts to visitors coming from mobile users. Mobile websites and applications are much faster and one can have online and offline access just at the drop of a hat. Many issues which affect the performance of an e-commerce store like delayed caching, high load time, and other related hassles can be sort by using extensions. Integrating extensions is not a big deal and one can make use of tools like Turpentine, Full Page Cache, and Varnish. The faster the page loading speed is, the happier the customers are. The most significant and crucial tip to follow is that many potential transactions are left in the lurch at the checkout pages that are too lengthy or difficult for the users to understand which leads to empty cart and the users rarely return. Hence, it is crucial to have an expeditious, safe, and simple checkout process. It should be easy for the visitors to make the payments by amalgamating all the card and wallet options, and gateway. According to a statistics, the average conversion rate of e-commerce stores is between 2-9%. The rate must be enhanced in order to boost the business. There are some sorts of strategies which focus mainly on converting the visitors that visit our site but do not buy anything from the store. This requires a much logical approach that gives significance to the conversion of visitors to the clients. Initiate the process by setting up the priority of the web pages on the basis of the conversion rate. Attract maximum clients towards your store by utilizing sponsored ads or organic activities. Using Flat Catalog can help protect your database from messing. Flat Catalog is of immense benefit to speed up and enhance the performance of Magento. Through Flat Catalog, everything can be done in a systematic manner. It allows the database to create a single table for a single product instead of sorting the data into multiple tables. This greatly effects and boosts database query execution and data fetch time. The above-mentioned tips are simple yet essential to make sure that the Magento powered store gains reputation, revenue, and customer base. In case you lag behind technical skills, feel free to connect with any website development agency to get the desired results.